Bitdefender and Kaspersky Labs online security program for Windows and MacOSX have taken the top spots in the category of antivirus and security program for computers. But which one is the best for you? Both Bitdefender and Kaspersky Labs provide a free antivirus version, and you can try the trial version for premium products for a month to experience the security benefits. We are going to look at the Bitdefender versus Kaspersky comparative and provide you with details that you did not know about the antivirus programs before. We will begin with the Bitdefender security program, and we are going to list the features you are going to get from the Bitdefender Security program 2018. Founded: Florin Talpeş is the founder of Bitdefender, and he is a Romanian. The Bitdefender company headquarter in Bucharest, Romania, and the updates you are going to receive is from Bucharest. Advanced Threat Defense, Webcam Protection, Anti-Phishing, Anti-fraud, Safe Files, Secure Browsing, Rescue Mode, Bitdefender Autopilot™, Bitdefender Photon, Global Protective Network , Game, Movie and Work Modes, Battery Mode, Worry-free & fast online Bank & shop, Parental Advisor, Privacy Firewall, Social Network Protection, Password Manager, File Shredder, and Quick Risk Checker. Yes, you are going to get all the above features in the base package of the Bitdefender, but some of the features offered in other Bitdefender packages, and we are going to list them below. BOX 2 – $249.99 and it is available for an unlimited number of connected devices for one year. Total Security 2018 – $89.99 up to 5 devices for one year. Family Pack 2018 – $119.99 unlimited devices for one year. Internet Security 2018 – $79.99 up to 3 devices for one year. Antivirus Plus 2018 – $59.99 up to 3 devices for one year. Antivirus for Mac – $59.99 up to 3 devices for one year. Mobile Security – $14.99 for one year and one account. Bitdefender Install & Setup – $39.99 per device. PC Optimizer – $59.99 per device. System Repair – $79.99 per device. Virus & Spyware Removal – $99.99 per device. 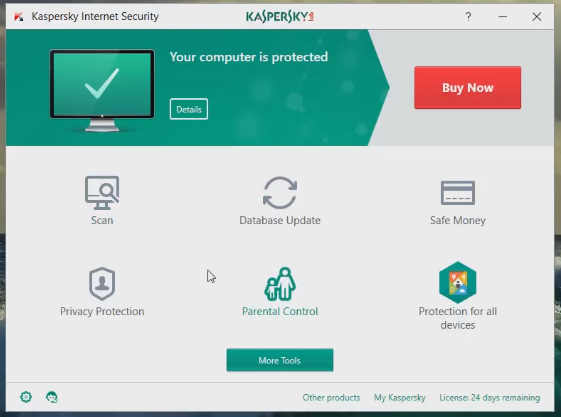 Kaspersky Labs is one of the popular security programs in the world, and they have been in the news since last year because the Government of the USA has dropped Kaspersky products from the USA market and Hungarian government banned it. Founded: Natalia Kaspersky and Eugene Kaspersky founded the Kaspersky Labs in 1997, and the duo is from Russia. Kaspersky Labs is a Russian based security company, and the headquarters are located in Moscow, Russia. The security updates you receive on your computer developed in Moscow, Russia. HuMachine Intelligence Approach, Multi-Layered Endpoint Security, Anti Targeted Attack Cyber Security Services, Empower Security Operations Centers, Fraud Prevention, Remote Security Management, Security Controls For Applications, Devices, And Internet Access, Enhancing Security And Extending IT System Management, Centralized Management, Small Office Security, and Home IT Security And Mobile Security. Kaspersky Labs offers much variety of security packages, and we are going to list them, so you can decide which one suits you the best. Kaspersky AntiVirus – $39.95 for one PC with one year license. Kaspersky Internet Security – $59.95 for one device with one year of license. Kaspersky Total Security – $79.95 for one device with one year of license. Small Business – it covers 1-50 Employees, and it is suitable for small IT business. Cloud – $485.00 for ten computers with one year license. Select (custom package for business) starts at $539.00 for ten desktops with one year of license. There are more packages offered by the Kaspersky Labs, but they designed it for IT companies, firms, and business. The time has come for the comparison between the Bitdefender and Kaspersky. Kaspersky reputation tarnished when the Hungarian Government has banned it from the market. However, Kaspersky denied all allegations to help Russian Government. But, you have to keep in mind that the Hungarian Government has not provided any proof to prove the allegations. We are pointing it out because we cannot comprise your security without knowing the truth. Performance: Regarding performance, Bitdefender and Kaspersky perform the same. But, if you are using old computers like Pentium Dual-core, then your PC is going to slow down. Both programs are going to slow down your PC. However, it works smoothly on the latest devices and computers. Security: Bitdefender and Kaspersky have stronger security encryptions and threat detection engine. However, Kaspersky has become a little difficult to trust after getting banned in Hungary. The President of the USA has signed a law to ban Kaspersky from the market. Kaspersky is losing credibility and trust in their security. Security updates: You receive regular security updates and virus engine update on a daily basis. Price: Regarding price, Kaspersky offers a base package for $39, and you can get Internet security from non-market for $10. While Bitdefender offers a base package for $39 and you can get no further discounts from the company. Price to Value: According to me, Bitdefender provides better value for your money. You can buy the base package for $29 (discounted) and use the same serial on five devices. You can get $10 discount if you are switching from Kaspersky. So which one you should buy? I would recommend you to buy Bitdefender if you have more than one device to protect. Kaspersky Labs security is questionable because of the bans. Apart from that, I think Kaspersky is a cheap solution. Let us know what do you think about Kaspersky and Bitdefender in the comment section below. FOUNDATION EURIS- AN EXCELLENT STEP OF APPROACH BY JEAN CHARLES NAOURI FOR THE EXTREMELY TALENTED FRENCH STUDENTS FROM POOR BACKGROUND! !